GM Prices the Chevy Volt at $41,000. Will Buyers Plug In? General Motors finally has the answer for how much the Chevy Volt will cost: $41,000. That's been the big -- and lingering -- question consumers have had about GM's first plug-in hybrid electric car. At the same time GM announced the suggested retail price today, it started taking orders online for the Volt, which can go 40 miles on a single charge of its lithium-ion battery before the gasoline engine kicks in. GM plans to start delivering the Volt in selected regions of the U.S. by year-end. GM executives are touting the Volt with no small measure of swagger. "This is the car of tomorrow. This is the future of the cars. General Motors is leading the charge," says Joel Ewanick, GM's vice president of marketing for North America. Other carmakers and historians might disagree. GM isn't the first carmaker to launch a mass-produced plug-in hybrid -- that distinction goes to BYD Auto, which introduced one in its home market of China in December 2008. Tesla Motors (TSLA), which recently became a public company, started rolling out all-electric cars in 2008, and major carmakers, such as Nissan (NSANY) with its LEAF, are launching their own all-electric models soon. It's no coincidence that major automakers and upstarts such as Coda Automotive are launching some types of electric cars in the U.S. around the same time. Rising oil prices a few years ago and the growing concerns for climate change highlighted a need for more fuel-efficient, less-polluting cars. The federal government has spent billions of dollars to promote electric-car research and manufacturing. It's also offering a tax credit of up to $7,500 for owners of those cleaner-burning vehicles. GM executives know they face a daunting challenge in marketing the Volt. The vast majority of consumers have no experience driving even a regular hybrid electric car such as Toyota's (TM) Prius, which has a small battery and still relies mostly on a gasoline engine. Unlike a Prius, Volt will be able to get miles out of its battery alone, which will need to be recharged by plugging a cord into a regular, 120-volt socket or into a 240-volt charging device designed for speedier charging. Consumers in general have expressed two major concerns about owning a car that's partly or entirely powered by an electric motor: How far can it go without recharging, and will enough public charging stations be available to refill the battery whenever they need (particularly useful for apartment dwellers or when you're on the road with your electric car). Here are some numbers consumers can expect to hear from GM and its dealers. The battery could last 40 miles, while a full tank of gasoline could propel the Volt for another 300 miles. Driving a Volt would save its owner 550 gallons of gasoline over 15,000 miles, Ewanick says. And it will have a top speed of 100 miles per hour. A federally funded program is underway to create 15,000 residential and public charging stations in six states and the District of Columbia. The program is meant to support the launch of the Volt and Nissan's LEAF. 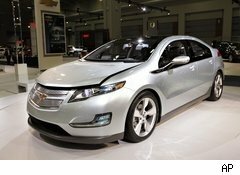 The Volt will first show up in Austin, New York City, Washington, D.C. and California in 2010's fourth quarter. Roll-outs in the rest of New York, New Jersey, Connecticut and Michigan will take place in the first quarter of 2011, says Tony DiSalle, Volt's marketing director. Although GM is quick to note the Volt's range, it can't yet talk about the car's fuel rating, which is an important marketing tool for any carmaker. Last year, GM said that the Volt could get 230 miles per gallon in city driving. The carmaker came up with that number based on a proposed testing method by the Environmental Protection Agency, but the EPA has since changed its mind. Because nothing like the Volt has shown up in the market before, the EPA is grappling with ways to come up with ratings that would provide consumers with meaningful comparisons between the Volt and other vehicles. GM officials decline to say when they expect to make a profit from the Volt, which is more expensive than some of the popular sedans. Nissan has priced its LEAF at $32,780 (before the federal tax credit) and last 100 miles per charge. In comparison, the Prius starts at $22,800, and the hybrid Civic at $23,800. GM will be spending more money on customer service -- from taking orders to answering questions about how to drive and charge the Volt -- than it otherwise would for a launch of a conventional gasoline-powered car, DiSalle says. Consumers can place orders online, prompting calls from Chevy representatives to confirm the order and the production schedule. GM says customers will be able to track their order status online as well. GM doesn't expect to sell a lot of Volts in its initial years. The plan is to produce 10,000 units through 2011 and 30,000 in 2012. More information about warranties, upgrades and financing options can be found at getmyvolt.com.